GALION — With the holiday season upon us, Galion is gearing up for another big celebration. The 2017 Come Home to Galion Celebration is Saturday Dec,. 2 and is on target to be the largest and busiest thus far. A new addition this year is Breakfast with Santa at the Depot Pavillion. Due to capacity restrictions, there are two sessions planned — 8 and 9:30 a.m. — with tickets only remaining available for the 8 a.m. time slot. Tickets are $5 and can be purchased at the Galion Crestline Chamber of Commerce office on Harding Way West. Ticket prices include breakfast and a photo with Santa. The event is sponsored by Avita. Another new event — for all ages — is the Reindeer Dash at 11a.m. This is a fun family event for all ages. Participants can sign up as a team of two or four friends, family, or co-workers at a cost of $10 each and receive a holiday t-shirt as well as reindeer antlers, a fake nose, and jingle bells to wear during the run .. and througout the day. The relay will be held between Market and Union Streets on Harding Way West. Registration deadline is Monday Nov. 27 in order to guarantee an event shirt. To sign up, contact Miranda Jones at the Galion-Crestline Chamber of Commerce at 419-468-7737or email mjones@galion-crestlinechamber.org. From 1-3 p.m., the Gill House, on Harding Way West, is holding a Moana Luau. Children are invited to come dressed up to participate in games, crafts and more. This event is free, and all children who attend are invited to walk in the parade at 4 p.m.
Also from 1-3 p.m., members of Gospel Baptist Church present a Live Nativity on property next to Brownella Cottage on South Union Street. This will involve actors and animals depicting the first Christmas. Cake and Icing, 114 Harding Way West,is offering cookie decorating — free of charge. Children also are invited to stop by Central Hotel on Public Square to write letters to Santa from 1-3 p.m.
Galion Public Library will have its annual Holiday Open House from 1-3 p.m. It includes live entertainment and crafts for kids in the lower level Childrens Room. Friends of the Galion Public Library will be having a raffle for various items during the day, and there will be carriage rides around town. Brush & Palette Art Gallery is sponsoring an Elf Hunt from 1-4 p.m. Participants will start at Galion Public Library to get instructions and locate their first elf. Elves are hidden at other businesses in the uptown area, and children who find them all can turn their paper in at Brush & Palette to receive a prize that day. There will be live entertainment on the stage at the Public Square from 1-4 p.m. Eagle Dance Center and St Joseph’s Catholic School choir are a couple of those scheduled to perform. 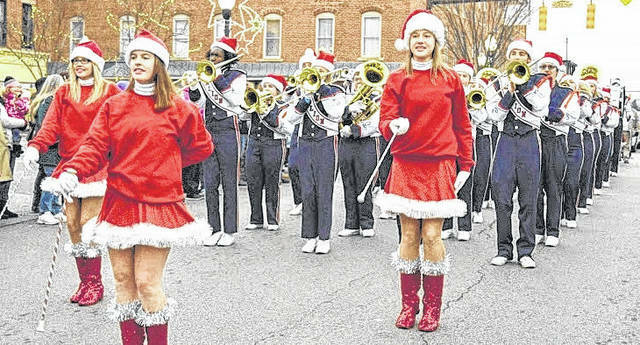 The Christmas Parade will step off from First United Church of Christ at 4:15 p.m. and proceed through the Public Square. Grand Marshals for this years parade are Galion’s 2017 10u state Little League champions, who will be joined by other Galion All-Star teams to kick off the parade. Entries for the parade are still being accepted. Information is available on the Come Home to Galion Facebook page. Following the parade, the Christmas Tree Lighting is set for 5 p.m., with the Santa House opened up for the season at 5:15 p.m. Kids will havea chance to St. Nick and share their Christmas wishes. To conclude the big events of Come Home to Galion, children and their families are invited to attend the Polar Express Experience at Galion Community Theatre. Wear your pajamas and enjoy a trolley ride from the Theatre to the Galion Depot for a snack, then ride back to the theatre for a showing of the Christmas favorite “The Polar Express” beginning at 7 p.m. Tickets for this event are just $5 and can be purchased at the Galion Crestline Chamber of Commerce in uptown Galion. This event is sponsored by My Floors by Prints and Paints.